Arsenal will play French side Rennes and Chelsea face Ukraine's Dynamo Kiev in the last 16 of the Europa League. Rennes are 11th in Ligue 1 while Kiev are second behind Shakhtar Donetsk in the Ukrainian Premier League. The Premier League clubs avoided Serie A's second and third-placed sides Napoli, who face FC Salzburg, and Inter Milan, who play Eintracht Frankfurt. 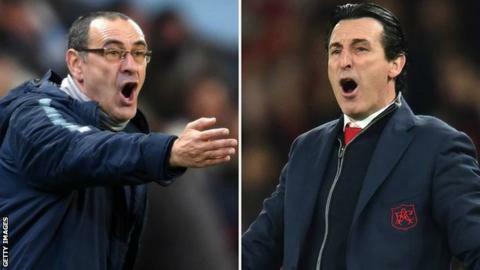 Arsenal boss Unai Emery's former club Sevilla face Slavia Prague and Celtic's conquerors Valencia play FC Krasnodar. Arsenal and Chelsea were originally set to both play at home in the first leg on 7 March, with the return games a week later. The Arsenal tie has since been switched, with the Gunners playing at home in the second leg on 14 March. They beat Bate Borisov 3-1 on aggregate in the last round while Chelsea eased past Malmo 5-1 over two legs. The Blues won the competition in 2013 while Emery led Sevilla to victory in the Europa League in the subsequent three years.